download the methodology here and DIY! 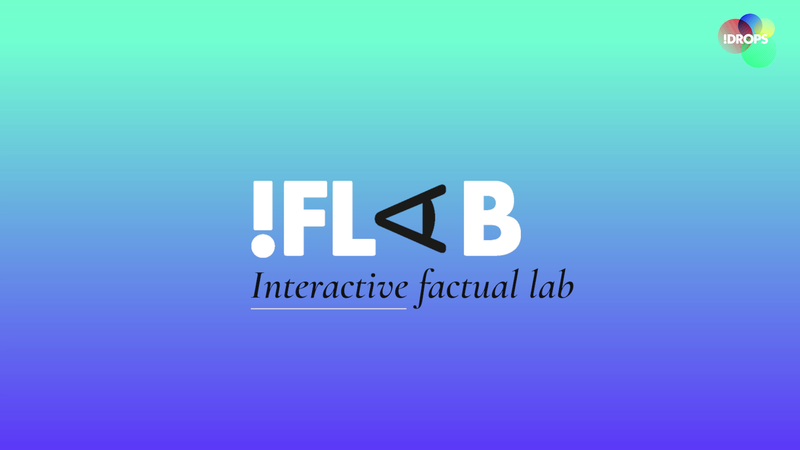 !F Lab – the Interfactual Lab – helps creatives to produce and develop their digital interactive factual stories. We enable talented creatives to tell impactful stories using digital technology. We offer a stimulating space to experiment, to work transdisciplinary and trans-sectoral, to generate know-how and to let a professional network expand in the field of interactive storytelling. Build your interactive story from idea to prototype. !F Lab is a training in interactive storytelling which reaches across various digital and creative forms. The output can be an app, a game, a VR project, a web-docs or something still to be invented. The training guides you from ideation to prototyping your projects. !F Lab is an !DROPS-initiative, led by Sandra Gaudenzi and delivered with support from Creative Europe. Our aim is to create a neutral space, where all platforms and formats are equal, to explore one main question: how can we communicate our factual stories, today, using interactive media? If you would like some examples, take a look at this playlist curated by Sandra Gaudenzi for MIT’s Docubase or browse !F Lab’s Resources for inspiration. What makes us unique is that we have developed our own methodology and work process, the WHAT-!F-IT-process. !F Lab seeks to merge complementary elements of idea development in design and storytelling into an original process, placing the user firmly at the control panel. Moreover, we go beyond inspirational talks, we “make” with you. The emphasis is on learning through practical experimentation and the freedom to explore ideas unhindered by prior bias or assumption. If you have an idea for an interactive factual story, for an app for change, or are working in tech and have a desire to create around meaningful subject matter, we’d love to hear from you. We welcome individuals and professional teams from a broad spectrum of backgrounds and industries: coding, web design, games design, journalism, documentary filmmaking, photography, video production, television, radio, education, social activism, the arts and creative industries. Previous experience in webdocs or interactive factual storytelling is not absolutely necessary. What is your story, why is it interactive and who is it for? Start drafting your first project treatment with us! Story Booster is the first of our two workshops. During five days we will work together to consolidate your story and test its strength. Does your idea have legs? Is there a clear value proposition for the user? What should its platform and shape be? Is it feasible technically and financially? You will be coached by our dedicated !F Lab trainers and benefit from the input of guest speakers and international experts in the field. – Learn about user-centred storytelling – put your user at the controls! – Think about finances! – do your business canvas and assets maps from day one. Prototype Booster is set over five days and aims at giving a first digital skin to your project. Here is where you will mix with extra developers and designers to work on your first digital prototype, or to elaborate on the work you have already done. It is about going one step up on the production scale and pitch your idea to a professional panel of experts. Guiding you through all the essential areas of idea development, Story Booster and Prototype Booster enable you to gain skills in story ideation, prototyping, user testing, user experience, budgeting, interface design, agile development, coding, digital strategy, pitching, funding and marketing. Take a look at our Liveblog for a taste of !F Lab 2017! To get the most from !F Lab you need to participate to both the Boosters, as this guides you through the entire process and entitles you to professional mentoring between events. However, if you want to join us without a project, you can attend one Booster only. Contact us to discuss your specific case. Our coaches from the 2018 edition: Sandra Gaudenzi, Mike Robbins and Jiannis Sotiropoulos. Many thanks for their participation and unbelievable dedication to !F Lab and foremost to the participating projects. They were there to guide them through each development phase, advice and motivate where possible. Boosters also feature inspirational sessions with digital makers and special guests with expertise in finance, budgeting, distribution and pitching. Sandra is the Head of Studies of !F LAB. As such she curates and designs the workshops and has initiated the !F LAB methodology (see the WHAT IF IT Process). She is an international expert in interactive narratives and does research in all new forms of digital storytelling. She is Senior Lecturer at the University of Westminster where she has launched the disLAB MA (digital and interactive storytelling LAB), UK’s first practice based interactive non-fiction MA. She also co-organises i-Docs Conference and research group, University of the West of England. There, she published the book “i-docs: the Evolving Practices of Interactive Documentary” (2017). Mike is Creative Technologist and a partner at Helios Design Labs, where he has been for the last 15 years. He oversees the interactive part of Helios’ creative output. Recent storytelling projects that he has worked on include The Disaster Resilience Journal with the European Red Cross, Highrise with Kat Cizek and the NFB, Offshore with Brenda Longfellow, or 17,000 Islands with Thomas Østbye and Edwin. His work has collectively won a number of major awards and nominations, including a Peabody for Short History of Highrise, an Emmy and has been featured in such venues as IDFA, Sheffield DocFest, smartFip@, Bristol iDocs, MIT Docubase and other. Jiannis is a Berlin-based creative technologist exploring the borders between game, interaction and participation in cross-platform storytelling. He established Honig Studios to produce story-driven experiences that are playful and memorable across multiple platforms. He has led the creative development of interactive experiences, games and apps for ARTE, the Red Cross, Universal Music, Sony, HABA, Schmidt Spiele and others. Elie Levasseur (FR), is a French matchmaker and event organizer with a focus on AV Digital content. We are there for the makers of interactive stories. We try to give them room and freedom to experiment with their ideas and explore the available technology. We try to push them and challenge them, so that both the projects get better as well as the potential of the technology is stretched to (and beyond) its limits. We keep in touch with our alumni and we do our best to help them with the further development of their skills and projects, where we can. We are continuously building our network of makers, producers and investors, trying to make the field as a whole profit from each other as much as possible. The !F Lab training programme consists of two 5-day events, the Story Booster and the Prototype Booster, over a total of 5 months. They are led by internationally renowned coaches with the added contribution of ad-hoc specialists. The Lab is set up to guide you through the entire design process, from concept consolidation to digital prototype, so it is required to attend both boosters. Some exceptions are possible, especially if you want to join us without a project. In that case do get in touch. The 2018 participation fee for the complete training is 1.100 Euro. If you are already working in a team for your project, a discounted rate of 750 euro is applicable for every added team member. Ideally each team sends one creative practitioner and one technical practitioner to !F Lab. If you do not have a project and want to learn about our methodology or be an observer helping the other participants, you can attend one booster. Contact us to discuss your specific case. Tell us about yourself and your interactive factual project idea! We had another amazing edition of !F Lab, April – August 2018, with VR, AR (Hololens), an interactive exhibition, webplatforms, apps, an archive web-doc, and much more, addressing topics such as autism, children’s emotional world, Polish artists, Luxembourgian work migration to Brazil, WWII refugees to Sweden, personal data and future technology or alarm clock stories. Stay tuned for more news on !F Lab and the next edition. To stay up to date with all our newest developments you can follow us through: Facebook & Twitter. !F Lab has been set up by !DROPS, in close co-operation with Sandra Gaudenzi, who is our Head of Studies. !DROPS is a social innovation agency. We co-create answers to social issues, both close to home as well as across borders. We believe in the power of people. We work in an interdisciplinary way and we see arts and technology as the tools per se to address these issues. We try to stimulate people in a positive way and bring out their talents in a complex society. We aim for a liveable 21st century for everyone. Our expertise is currently focused on six global topics: superdiversity, care, global development, sustainability, community building and new learning. We reach results with guts and confidence.